A HUGE thank you to each and every one of you that I worked with in 2010. I had an amazing year with all of my couples and all of the amazingly talented vendors I worked with. Have a blessed New Year! 2010 was a busy one! 22 events in 12 months kept me on my toes. The holidays have been great to catch my breath before jumping into 2011. 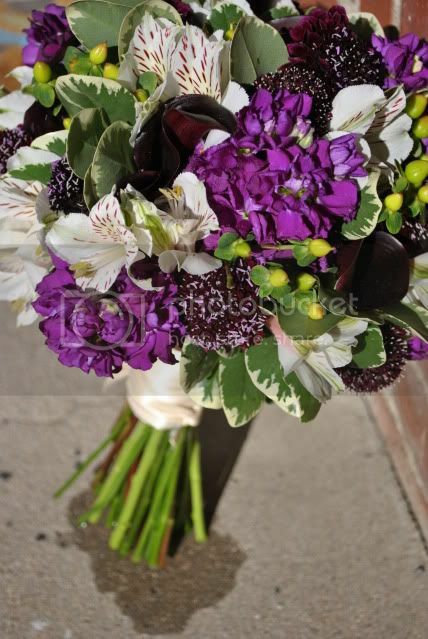 2010 brought a few brunch weddings, quite a few purple weddings and terrific clients. I kicked off the year with a snowy March wedding with a wonderful Bride, Jennifer, and was lucky enough to work with her sister in September. Jennifer had guests from all over the world at her Lumber Baron Inn wedding, they were lucky enough to see Denver’s crazy spring weather with a blizzard for the rehearsal and a perfect sunny day the morning of the wedding. May brought Yvonne and she chose “green” flowers, not the color, but sustainably grown flowers. Her bouquet will always be one of my favorites. Early June brought a little cold and rain but Alicia and Joe toughed it out and were just adorable! Rene Tate took their amazing photos. July was filled with other events so I was only able to squeeze two weddings in, both on the same day, one in Loveland and one in Golden, and very different. That Saturday was 100 degrees outside and boy did I sweat when I dropped those flowers off! This was Kelly’s Bouquet, pink and orange! I had a blast designing it! Rachel and Jeremy were married on the hottest day in Colorado too at Sylvan Dale Guest Ranch in Loveland. Jenny and Leviy were my fun August couple, full of energy, love and their families were a blast to work with the morning of their wedding. Karie McClain took these fun photos. Their wedding was seriously awesome, Jenny’s attention to detail was amazing. After Jenny’s wedding I was back to my other events for a month and then came time for my brother’s wedding. It was a beautiful day! A perfect day, the sun was shining, the leaves were the perfect color and our family was all together. Here are a few pictures of my weekend. I have yet to do a blog post on this wedding. A week after their wedding I headed down to the Springs for a wedding at Hillside Gardens and fell in love with the venue. If I could own someplace to have weddings, this is exactly what it would be like! Jenny’s sister Kristin lucked out with a beautiful September day. That’s it for pictures…to those of you that I consulted on weddings or events with, I had fun. Seriously the creativity and unique ideas each of you bring to the table keep me inspired! Again, thank you to each and every one of you! I had a great 2010 wedding season and I’m looking forward to what 2011 has in store!